The Ministry of National Heritage and Cultural Affairs has sought local and foreign expertise in its struggle to restore the discoloured frescoes of the historic Sigiriya rock fortress. Cultural Affairs Ministry Secretary Wimal Rupasinghe said through there is no major damage caused to the frescoes there is a problem of discolouring of the frescoes. “We have noticed white patches on the wall paintings but have yet to find whether it is due to weather extremes or a chemical reaction,” he said. He said that a team of Sri Lankan experts including a number of academics have been to Sigiriya on Friday to collect samples of the substance that may be the cause for the discolouring. These samples are to be sent to the conservation laboratory set up at the University of Moratuwa. The local team of experts include Architect Professor Nimal De Silva, Professor Jagath Weerasinghe, Dr. Arjuna Thanthirige of the Post Graduate Institute of Archaeology, University of Kelaniya and Dr. Mohan Abeyratne of the Central Cultural Fund. “We are also hoping to get the assistance of an Italian expert from the International Council on Monuments and Sites, an organization that works on conserving historic monuments and sites”, he said. Sri Lanka sought the assistance of renowned Italian scientist Dr. Luciano Maranzi twice in 1967 after a politically motivated mob dabbed thick dark green commercial paint on the frescoes and used daggers to damage some of the murals and again in 1978 when cyclonic winds caused damage to the frescoes.In 1978, Dr. Luciano in his report to the UNESCO stated that effect of the sun on the paintings tends to damage them and suggested that restoration work should be done periodically. Presently only 22 out of approximately 500 murals remain today on the western side of Sigiriya, one of the eight sites of Sri Lanka in the UNESCO World Heritage list. An Archeology Department source said that the protective layer of the frescoes has been destroyed with time and was in need of immediate restoration. Without a protective layer the frescoes are in danger of being discoloured. “Local experts are trying to find the reason for the white substance that is spreading over the frescoes. Damaged plaster should also be supported by injection of synthetic resin”, he said. The water content in the rock, sunlight and atmospheric air andchemical changes in the rock are some of the possible reasons for the discolouring. The source also stated that it has not been proven that chemicals used to drive away wasps had any connection with the discolouring. 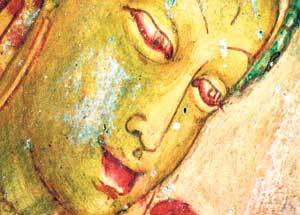 Malinga Amerasinghe, Head of the Department of Archaeology of the University of Kelaniya said it is important that the authorities make maximum effort to preserve the murals. “All the other figures had been erased with time as there was no restoration done while they were exposed to extreme weather conditions and well as sunlight. These few frescoes survived because of the secure surroundings,” he said. He said that some of the chemicals used in the restoration may have triggered the discolouring.“It is therefore important to use the latest technology that will restore the frescoes for a long period of time and not cause anychemical reaction with time,” he said. On Monday President Mahinda Rajapaksa visited Sigiriya and observed the present state of the frescoes and also noticed the stained patches. The President also requested the authorities to immediately look into the problem and restore the frescoes. In 1831 Major Jonathan Forbes of the 78th Highlanders of the British Army while returning on horseback from a trip to Polonnaruwa is reported to have come across the “bush covered summit of Sigiriya". Sigiriya then came to the attention of antiquarians and later, archaeologists. In 1831, during Sir William Gregory’s period and in 1899 tracing paper had been used for line drawing thereby causing damage. In 1938, all the frescoes including those that were restored and the orginal ones were all painted with water colours. In 1967, a thick dark green paint was thrown on a number of frescoes disfiguring them. Then Archaeological Commissioner Dr. Rajah de Silva was successful in bringing an experienced chemist Dr. Luciano Marenzi from Italy to help out with the restoration. 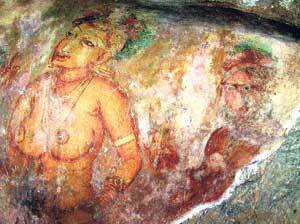 Since then no major damage has been reported but the gradual fading of the frescoes of the ladies of Sigiriya continues.